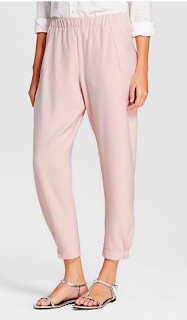 Yesterday we looked at some unlikely workwear bottoms, today I thought we would keep the trend going with some crepe crop pants. They're perfect for summer because they're light and easy to pair with a simple top and a statement necklace. I mean, come on. These pants just scream spring! Rosy pink that you can dress down with flats or dress up with some heels and a blazer. 55% off? Don't mind if I do! Love this minty blue pastel color! Looking for something basic? Try these black pants to wear with some bold prints and button downs. This color. So saturated and rich! And the price? Yes. I love a comfy crepe in a crop length for work because it's something different but versatile. Just like we get weary deep into sweater weather, you're going to feel the same fatigue for sundresses, so try these crops on for size.